Is this post a part of my blog’s mission or not? Is it enough that I just have thoughts that connect movies? You know what, who cares? If you do care, you may want to know that mild spoilers show up later in this post. Is it too great a stretch to argue that what’s problematic in both films [There Will Be Blood and Barry Lyndon] comes to almost the same thing? Since both adapt generally forgotten period novels that demand a sympathetic jump: the issues of the characters aren’t exactly ours, and even when they are we talk about them differently, in terms already conditioned by the history of the discourse….It’s ground we’ve all been over a thousand times before. But of course the characters haven’t, and for them the issues have an urgency we can’t begin to match. Pat Graham refers, in large part, to how hard it is to connect with the human beings in Barry Lyndon and with those in TWBB. With respect to TWBB, when he says “problematic” I think he’s talking about how empty its narrative turns out to be and feel, how devoid of humanity most of its major characters are. And I agree, even after seeing it twice, that this is how the movie makes us feel: empty. But it has to. Emptying is among its main themes. It’s about emptying Earth’s deep places of lubricating oil. It’s about being empty of discernible identity: H.W. is nobody’s son; Paul and Eli might or might not be two people; Henry isn’t Henry the long-lost brother. There’s even that diary containing pictures of unidentified people in Plainview’s life. Emptiness is what TWBB has to leave you with: the greedily religious (Eli) and the religiously greedy (Daniel) meet, they mutually annihilate, and Daniel then sends his own damaged son off into the annihilation of the Great Depression. And Daniel Plainview’s already iconic catchphrase at the end–“I drink your milkshake!”–is as evocative and off-kilter an image of emptying as Hollywood has ever produced. 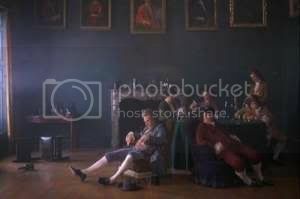 But “Barry Lyndon” is a film that 32 years later is little remembered because the picture is so emotionally remote that viewers disconnect from its inert storytelling. I’m wanting to quibble about how “little remembered” Barry Lyndon really is, but I’ll resist except to say that Time places it among the 100 All-Time Best films. My point here is that these are movies about unlikeable people. Critics use phrases like “sympathetic jump” and “emotionally remote” quite rightly in describing movies that need to leave a yawning chasm between main character and viewer. The emotional “thud” at the end is the sound of every viewer hitting rock bottom, having fallen with Lyndon and Plainview. Barry Lyndon steals and lies and sleeps his way across Europe, only to die penniless, hobbled, and unloved. Daniel Plainview loves oil above all things, hints at coveting his adopted son’s wife, and destroys a religious charlatan who’s a mirror to Daniel’s own empty greed. He ends up “finished” in the [indoor bowling alley] gutter of his own making. That we stand and leave the theatre struggling to feel anything for these films is the mark of their burning power and chilly confidence. 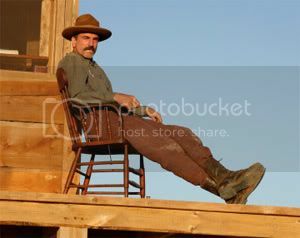 And even though Daniel Plainview “drinks your milkshake” in the end, somehow–thrillingly–we are the ones left cold. I can’t believe the first real article in this blog has to do with King Diamond. This is what I get for going to thrift stores. I bought just one item this time around: Hard ‘n Heavy Volume 5 on VHS tape. Take a look at that cover; cost me 50¢. The back cover, though, is what made me sacrifice the pocket change. 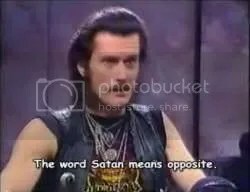 On it, I saw a tiny picture of King Diamond and the promise of an interview with he, the Danish Supreme Being of operatic black horror metal, himself an avowed Satanist. I obsessed about him as a teen and to this day I struggle to live with myself through annual bouts of dork-metal nostalgia, during which I cue up lurid cassette tapes that haven’t seen daylight in a dozen moons. Those same dark impulses forced this VHS purchase upon me. He’s right, you know. “Satan” does come from a Hebrew word that means “to oppose.” Fair enough. Satan does oppose a lot of stuff in general. The word “protein,” it seems, is from a Greek word meaning “of first importance.” But of course! Who would want to live a day without it? Not me. But I would like to add those two word origins together…add ’em up and find out that “seitan”–or “is protein”–really means “is of first importance.” And there you have the reason I wrote this entry. I bet King Diamond would be so proud.